» Full documentation prior to travelling with map, guidebook and discount card. Accommodation in one of Ireland’s fine Bed & Breakfast properties is a stay in your home away from home. The Irish farmhouse & country experience is ideal for those who want to escape the pressures of modern life, to be immersed in stunning rural landscapes and explore quaint towns and villages, while enjoying the leisurely pace of rural life. With over 1,100 Bed & Breakfast properties throughout the country, there is no area to be left undiscovered. Travel July 1, 2016 – August 31st, 2016: +$250.00 USD per person. 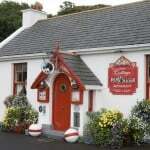 Interested in BED & BREAKFAST BREAK IN IRELAND?